How was my Friday night during this fine summer? House made pasta. Italian Grandma’s meatballs. Fresh, flavorful salmon. Seasoned olive oil and breaking bread with amazing friends. This was my Friday night. 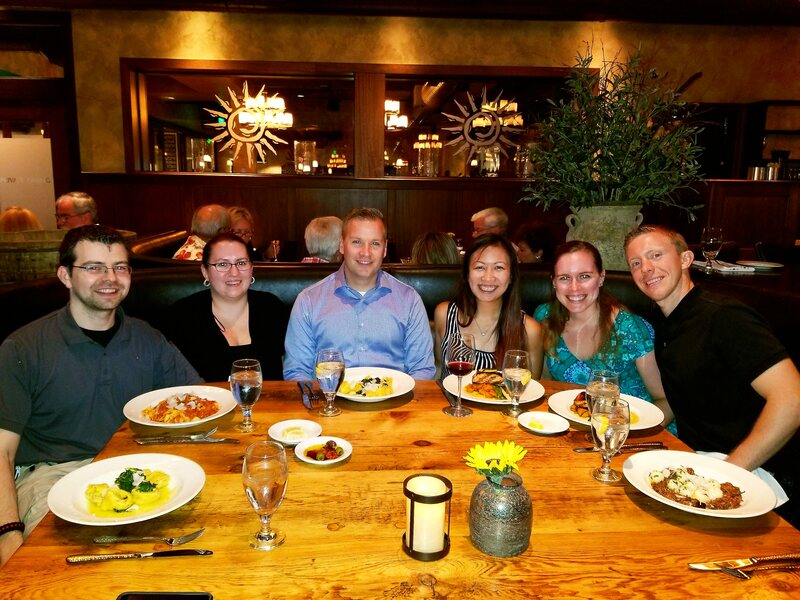 We all arrived on time for the reservation, and were surprised (and pleased) by the revamping that Tuscan Kitchen had undergone with operations. Check in is now set up in the entrance by the takeaway area, and the waiting area now is set up like a lounge. No more having to wait in the hallway by old host stand to be seated and be in everyone’s way! Our server, Edson, welcomed us promptly after we were seated, and launched into the appetizer and entree specials of the evening. For once, the dining decision making was easy for me – I had my eye on the salmon entree, and zoned out as Edson talked. I did order a glass of Chianti to loosen up a bit after the long day. As we all caught up on each other’s lives, our table runner brought fresh bread and olive oil for dipping. Edson returned a few minutes later to take our dinner orders, and T convinced everyone to try the Polpettoni – the Kitchen’s signature giant meatball appetizer (8 oz! ), made of beef, veal, and pork and topped with caramelized tomato sauce and burricotta. Hunger got the best of me and I missed my photo opp of this dish. R: Brasato do Cianghiale – a dish of four hour braised wild boar ragu and truffle marscapone gnocchi, topped with shaved pecorino tartufo. T and J: Veal Tortelloni – hand made veal and toasted garlic spinach stuffed pasta, drizzled with extra virgin olive oil. A: Pasta Bolognese – Emilia Romagna’s signature dish of braised beef, veal, and pork sauce, topped with shaved Parmigiano Reggiano. AP and me: Salmone alla Griglia – wood grilled salmon (medium to medium rare), topped with lemon olive oil and garlic, served atop sage roasted sweet potato and grilled Parmigiano asparagus. AP also ordered a side of Butternut Squash Walnut Mista to share with R.
The meal was delicious; the men’s pasta was gone within minutes of being served, and I devoured my salmon. The pastas were not chewy or overcooked, and the respective meat fillings / sauce were tender and flavorful. AP’s and my salmon were served at the correct temperature and was easy to flake apart with the fork. The sweet potato was a nice offset to the savory fish. We opted not to order dessert, as the sugar would have kept us up for the night. I did order a decaf coffee to go, and T ordered an iced latte to go (as he had to work after dinner). We asked Edson to split the bill according to each couple’s orders, which he happily obliged. In his haste, though, he knocked over a water glass onto AP and R, for which he apologized profusely while bringing over napkins to sop up the mess. At least T‘s storytelling made up for the mishap. It always seems that we leave each establishment with a bang … no need to cry over spilt water, eh? If you’re in the Salem, NH area, Tuscan Kitchen also has a store there.